opportunity to interact with Freeman and Shel. webinar of our coaching techniques on not only locating Bigfoot but learning to interact with them. Freeman and Shel we will send you all the information you need to be in attendance and join in the fun. We look forward to hearing from you at http://www.treepeekerswebinars.com!!! Feeling like the new kid on the block (blog) here … Hello everyone! Most recently I was asked a question and that question brought up more questions as one thing always leads to another. Which in my honest opinion is a good thing. How else would we learn from each other if we do not have the curious seeking minds hunting down the true knowledge of people we know we can trust? Simple: we can not! But, I do think some guidance in how people are approaching with questions wouldn’t be such a bad idea. Question your question! Just what do I mean by that statement? 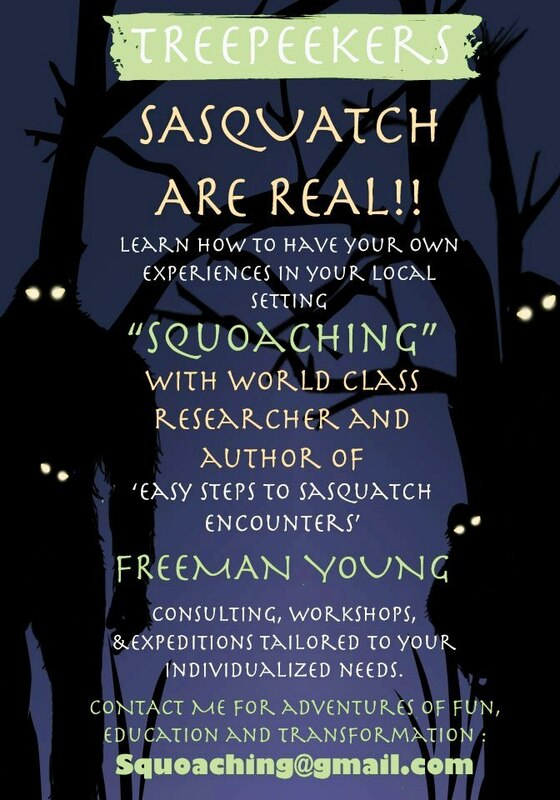 It has become my journey and destiny to help others understand and learn about The Sasquatch People. Therefore, I am very accepting of questions and invite you all to hit me up on those things you just can not resist asking. I am in no way shape or form complaining about people asking questions but rather constructively directing people in a good approach technique. There are a lot of people out there with a strong knowledge of our forest buddies and I am sure all of them would agree with me when i say question your questions. This simply means that there are a lot of questions to be answered and there are not enough hours in the day if I were to sit down with each and every person that wants to pick my brain clean of Sasquatch cob webs. Most of the time I find I spend half the time I allow myself to be available being redundant and repeating myself over and over. It becomes tiresome and I found that I was losing my lust to do what I love to do most and that being to teach everything I know to as many as I can. Simplifying your questions by asking yourself what you are intending to ask one of us first is a good way to save time on both our parts. Then ask yourself what do I already know about this question>? Sometimes just that little bit of injection of something you already know about the subject helps us direct a more pointed answer. The answers are then not pulled from us like you were hunting down a cavity but a more flow in conversation that leads us further down the road. Sometimes you can go from A to Z and skip B thru Y. There are times you can not go through it like that and we need the A B C ‘s of sasquatch. That all depends on the experiences and knowledge you already are bringing to the table. The only way we are going to know this is how you approach. Example: I would like to know what fruits Sasquatch eat? Person #1 Knows nothing of sasquatch and there question is fine where it sits and we are going to instantly realize this is someone we are going to have to start at A with and lead them on to maybe D. A lot of questions in between are gonna be asked back and forth. Where do you live? Do you know if you have sasquatch living close to you? Do you have fruit on your property that inspired your question? It goes on and on like that and can be rather time consuming for both parties. Person #2. Knows that they have disappearing fruit off their trees and they live in the Midwest. Person #2. Should direct their question with this: I live in the Midwest and I know that I have Sasquatch living close by. I am wondering if they maybe the culprit as to why I have missing apples and pears off my trees. What do you think? Person #2 just reduced their question down to a yes or no question. How much time they just saved us and didn’t even realize it. This little bit of help narrowing down your own questions and a little bit of self-analysis leaves open a bigger window of time for us to get in more questions answered and spend less time typing. It will make for a more efficient blog that is more interesting to read and we will all have more time to put those hiking boots on and hit the dirt running. Sometimes when we self-analysis we realize we already have the answers to our own questions. We just need to think on it a little bit. I have an example of that as well and it comes from the topic of Bigfoot vocalizations. I was asked if I could ask my clan if they could they could explain the meanings of all the calls they make!?!?! At first I thought to myself, you have got to be kidding me??? Did someone just ask me to ask my clan what ALL the bigfoot vocalizations mean???? With all do respect I know those of you that know me seen my one eye brow lift and the other one dip. So as I always do I pulled out Have Patients Shel 101 out of my back pocket and started typing along with a long winded sigh. Here is my reply to such a suggestion. Gee I would love to be able to make a catalog or dictionary rather as to what they all mean for them. It all comes down to simplistic realizations! I have been trying and trying to teach this but I just do not have enough hours in the day to always repeat myself … LOL I m not complaining… but rather frustrated that my point is never made sufficiently that people can grasp what i m saying… here goes ANOTHER attempt at some answers. Have you ever babysitted more than one infant? Infants all cry and only the mother seems to know or recognize what each individual cry means or which baby is hers for that matter. BECAUSE NOT ONE OF THEM SOUNDS LIKE ANY OF THE OTHERS With that in mind….. we have literally thousands of bigfoot howls, screams, cries, yells, bellers.. etc. recorded over decades! This is where I am once again making an attempt at saying… PEOPLE can not look at BIGFOOT as a specific breed of something and therefore we have this chart of each thing they do and the shoe is always going to fit each one.. the dictionary of bigfoot vocalizations ( speaking in terms of the howls, screams and yells ) is gonna signify a meaning for each and every noise they make. Literally impossible!!! THEY ARE A PEOPLE… and each and every vocalization is going to be specific to that individual. Now when i say PEOPLE…. i m not calling them one of US for those sensitive types here… but I view them as an indigenous people! Now with all that in mind imagine you are at a big sporting event… How many whoops, calling out, screaming, etc do you hear come out of a crowded stadium… ?? NOW…. .tell me what each one meant if you can only hear it…. not see whom made it?? or what side of the stadium they were on?????….. What kind of event or sport was being played? and what was going on in the game… or what was that individual expecting to happen …. that didn’t… or did?????? GET MY POINT????? We at Treepeekers would like to give a huge hug and many thanks to Dion Emerson & Christopher Noel for editing, Tosh Stone, Dan Elliot, Gail Forest, Joe De Gallo, Sanjay Singhal, Mark Parra, Linda Smith, Candy Sasquatch watch Canada, Nekea, Gigi Blossom, Rebcka Sisk, Christian Larson and Em Glo, for being the best of all secret holders, teachers, partners, students and supporters… cohorts and investors and all to the new ‘squoaching’ clients (who know who they are) Thank you! Sam Farns, Jack D. Barnes & Paul Guggenbuehl for FLIR and camera support and all of you 6o,ooo+ world wide readers and our 742 subscribers and all the friends and family & fans over at Treepeekers Youtube channel… I hope you loved it… we do and we’re sending ‘BIGGI’ love to all of you ‘12,21,12 has been an amazing year and we know 2013 will be even better bringing you more breakthrough info about our favorite study…Have a safe and wonderful new year… WHOOOP WHOOOOP! I am excited to announce that Treepeekers has a new partner to colaborate co author & co create to contribute to this blog with and to Treepeekers Publishing and Treepeekers.com and all World Hominid Research projects & Encounters Courses! Welcome aboard Shel Kaoke Dion! We are delighted to have your insights and experience added to this on going perspective evolution! Look forward to new editions coming out soon! Throughout the twentieth century, thousands of eyewitness reports of giant bipedal apes, commonly referred to as Bigfoot or Sasquatch, have emanated from the montane forests of the western United States and Canada. Hundreds of large humanoid footprints have been discovered and many have been photographed or preserved as plaster casts. As incredulous as these reports may seem, the simple fact of the matter remains — the footprints exist and warrant evaluation. A sample of over 100 footprint casts and over 50 photographs of footprints and casts was assembled and examined, as well as several examples of fresh footprints. The author examined fresh footprints first-hand in 1996, near the Umatilla National Forest, outside Walla Walla, Washington. The isolated trackway comprised in excess of 40 discernible footprints on a muddy farm road, across a plowed field, and along an irrigation ditch. The footprints measured approximately 35 cm (13.75 in) long and 13 cm (5.25 in) wide. Step length ranged from 1.0 – 1.3 m. Limited examples of faintdermatoglyphics were apparent, but deteriorated rapidly under the wet weather conditions. Individual footprints exhibited variations in toe position that were consistent with inferred walking speed and accommodation of irregularities in the substrate. A flat foot was indicated with an elongated heel segment. Seven individual footprints were preserved as casts. Perhaps the most significant observation relating to this trackway was the evidence of a pronounced flexibility in the midtarsal joint. Several examples of midfoot pressure ridges indicate a greater range of flexion at the transverse tarsal joint than permitted in the normal human tarsus. This is especially manifest in the footprint figured below, in which a heel impression is absent. Evidently, the hindfoot was elevated at the time of contact by the midfoot. Due to the muddy conditions, the foot slipped backward, as indicated by the toe slide-ins, and a ridge of mud was pushed up behind the midtarsal region. In October 1967, Roger Patterson and Bob Gimlin claimed to have captured on film a female Bigfoot retreating across a loamy sandbar on Bluff Creek, in northern California. The film provides a view of the plantar surface of the subject’s foot, as well as several unobstructed views of step cycles. In addition to a prominent elongated heel, a midtarsal break is apparent during midstance and considerable flexion of the midtarsus can be seen during the swing phase. The subject left a long series of deeply impressed footprints. Patterson cast single examples of a right and a left footprint. The next day the site was visited by Robert Laverty, a timber management assistant and his sales crew. He took several photographs including one of a footprint exhibiting a pronounced pressure ridge in the midtarsal region. This same footprint, along with nine others in a series, was cast two weeks later by Bob Titmus, a Canadian taxidermist. A model of inferred skeletal anatomy is proposed here to account for the distinctive midtarsal pressure ridge and “half-tracks” in which the heel impression is absent. In this model the Sasquatch foot lacks a fixed longitudinal arch, but instead exhibits a high degree of midfoot flexibility at the transverse tarsal joint. Following the midtarsal break, a plastic substrate may be pushed up in a pressure ridge as propulsive force is exerted through the midfoot. An increased power arm in the foot lever system is achieved by heel elongation as opposed to arch fixation. Noteworthy is the documentation of the tracks of this same individual on a number of earlier occasions. One of the first of these was photographed by Peter Byrne near Bluff Creek in 1960. Two others were cast by Al Hodgson, of Willow Creek, one on a logging road near Notice Creek in 1962(?) and another on Bluff Creek in 1963. Another instance was photographed extensively by John Green and Rene’ Dahinden on the Blue Creek Mountain Road in 1967, just over one month before the Patterson-Gimlin filmwas shot. A number of additional examples of footprints have been identified that exhibit a midtarsal break, either as a pronounced midtarsal pressure ridge or as a “half-track” produced by a foot flexed at the transverse tarsal joint . Each of these examples conforms to the predicted relative position of the transverse tarsal joint and elongated heel. The first example is documented by a set of photographs taken by Don Abbott, an anthropologist from the British Columbia Museum, in August 1967. These footprints were part of an extended trackway, comprising over a thousand footprints, along Blue Creek Mountain Road, in northern California. Deputy Sheriff Denny Hereford was one of several officers investigating footprints found by loggers on the Satsop River, in Grays Harbor County, Washington, in April 1982. The subject strode from the forest across a logging landing, then doubling its stride, left a series of half-tracks on its return to the treeline. Note the indications of the fifth metatarsal and calcaneocuboid joint on the lateral margin of the cast. The proximal margin of the half-track approximates the position of the calcaneocuboid joint. The track of an individual with a presumed cripple foot was discovered in Bossburg, Washington in 1969. The malformed right foot has been previously misidentified as a case of talipes equinoverus (clubfoot). However, it is consistent with the generalcondition of pes cavus, specifically metatarsus adductus or possibly skewfoot. Its unilateral manifestation makes it more likely that the individual was suffering from a lesion on the spinal cord rather than a congenital deformity. Regardless of the epidemiology, the pathology highlights the evident distinctions of skeletal anatomy. The prominent bunnionettes on the lateral margin of the foot mark the positions of the calcaneocuboid and cuboideometatarsal joints, which are positioned more distal than in a human foot. This accords with the inferred position of the transverse tarsal joint and confirms the elongation of the heel segment. Furthermore, deformities and malalignments of the digits permit inferences about the positions of interphalangeal joints and relative toe lengths, as depicted in the reconstructed skeletal anatomy depicted below. Variations in toe position are evident between footprints within a single trackway, as well as between individual subjects. In some instances the toes are sharply curled, leaving an undisturbed ridge of soil behind toe tips resembling “peas-in-a-pod.” In other instances the toes are fully extended. In either case, the toes appear relatively longer than in humans. Among the casts made by the author in 1996 is one in which the toes were splayed, pressing the first and fifth digits into the sidewalls of the deep imprint, leaving an impression of the profile of these marginal toes. This is the first such case that I am aware of. Expressed as a percent of the combined hindfoot/midfoot, theSasquatch toes are intermediate in length between those of humans and the reconstructed length of australopithecine toes. Furthermore, the digits frequently display a considerable range of abduction. The dynamic signature of the footprints concurs with numerous eyewitness accounts noting the smoothness of the gait exhibited by the Sasquatch. For example, one witness stated, “…it seemed to glide or float as it moved.” Absent is the vertical oscillation of the typical stiff-legged human gait. The compliant gait not only reduces peak ground reaction forces, but also avoids concentration of weight over the heel and ball, as well as increases the period of double support. Human walking is characterized by an extended stiff-legged striding gait with distinct heel-strike and toe-off phases. Bending stresses in the digits are held low by selection for relatively short toes that participate in propulsion at the sacrifice of prehension. Efficiency and economy of muscle action during distance walking and running are maximized by reduced mobility in the tarsal joints, a fixed longitudinal arch, elastic storage in the well developed calcaneal tendon, plantar aponeurosis and deep plantar ligaments of the foot. In contrast, the Sasquatch appear to have adapted to bipedal locomotion by employing a compliant gait on a flat flexible foot. A degree of prehensile capability has been retained in the digits by maintaining the uncoupling of the propulsive function of the hindoot from the forefoot via the midtarsal break. Digits are spared the peak forces of toe-off due to the compliant gait with its extended period of double support. This would be a efficient strategy for negotiating the steep, broken terrain of the dense montane forests of the Pacific and Intermountain West, especially for a bipedal hominoid of considerable body mass, The dynamic signatures of this adaptive pattern of gait are generally evident in the footprints examined in this study.